That’s gonna be Italian 70x111. Righty tighty both sides. You can’t really measure the distance between the cups as the 68 or 70 measurement is width of the BB shell on the bike. Don’t want you to disappoint someone expecting an English thread BB. I never mentioned English thread. So there is no such thing as an Italian threaded shell that's 68mm wide? There probably are, since we’re talking 2-3% margin of error in measurement, but the cups on that BB won’t fit in a true 68 mm English thread BB shell. If you shop for a bottom bracket and pick 68x111, you’ll get a 1.37 x 24 component. The picture of course makes it clear what you have but some people who don’t use these parts routinely might not understand and I was just trying to help clarify for you. There are cases with old bikes where someone started with a 68 mm English thread shell that got stripped and they had it re-tapped to an Italian thread standard. So there is no such thing as an Italian threaded shell that's 68mm wide? Usually by mistake. I had a 96 ELOS Cramerotti with such a shell. The story is the mechanic (kid) was talking on the phone, as he was facing the drive side of the bike and took too much off. They had to add a 2 mm spacer to get the BB and crank out far enough for the Chorus derailleur to be in range. I got a decent discount on it and it worked fine but it was annoying just to know what the clown had done. I've got a '73 DeRosa with a 68mm wide Italian threaded bottom bracket. It came to me that way. It was a repaint, so my guess was that the 2mm were cut off to remove rust. Could have been anything though. A couple of spacers fixed the problem. I've seen a few Fuji's that had 70mm ISO threaded bottom brackets as well. Before the Shimano empire took over things seemed to have varied quite a bit more than today. Yes, I found out the hard way and came up against the travel issue. 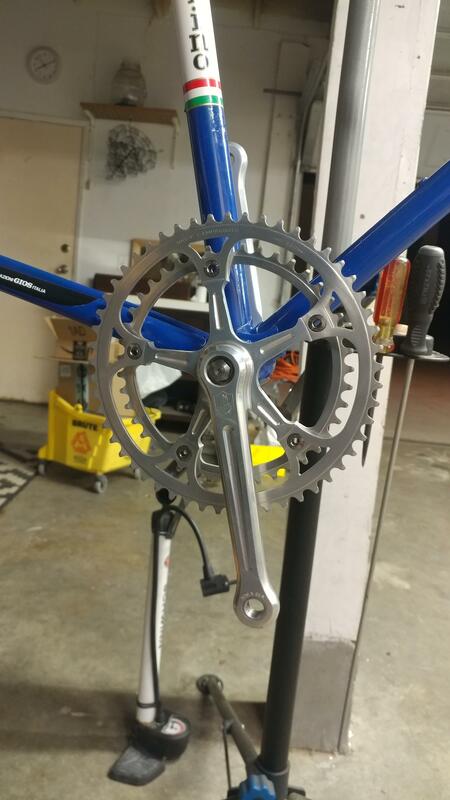 Since the Sachs 8 speed spacing results in a cassette that is 1.4mm wider than Shimano, hitting the largest cog with a 7 speed derailleur is dodgy. I REALLY love the ergos, but I'm afraid the other necessary bits are going to break the bank. My last ditch effort is a mid cage 105 8 speed RD, gonna try that one out later today. If my theories about Sachs components are correct, the 105 RD won't work for you. I think the movement ratio of the 8-speed Sachs rear derailleurs matched the 8-speed Campy rear derailleurs. This isn't only based on the fact that the Campy ergos are a back-dated clone of the Sachs ergos. I have a long cage Sachs RD that I'm using with 10-speed Campy shifters to index a 10-speed Shimano cassette. It works perfectly, which is the result that would be predicted if the Sachs RD matched the "old" Campy ratio. I know that sounds like pretty sketchy evidence, and you should probably treat it as such. But I think it's true. So, if my theories are correct, you could use a pre-2001 Campy Racing T rear derailleur. A Racing T RD isn't necessarily cheap, but they're at least a lot more common than the Sachs. Once again, I never mentioned English thread. Mentioning English thread afterward does not "clarify", it confuses. What distinguishes English from Italian thread is the fact that the drive side is clockwise threaded, correct? There may be a _correlation_ between thread type and shell width/spacing, but shell width/spacing is coincidental. So let's just say it's Italian thread, and let any potential buyer/trader infer the shell width/spacing, since it's the thread type that distinguishes. What distinguishes English from Italian thread is the fact that the drive side is clockwise threaded, correct? That, and Italian thread bottom bracket cups are 36mm in diameter and have a 55° thread angle, while English thread bottom bracket cups are 34.8mm in diameter and have a 60° thread angle. There may be a _correlation_ between thread type and shell width/spacing, but shell width/spacing is coincidental. So let's just say it's Italian thread, and let any potential buyer/trader infer the shell width/spacing, since it's the thread type that distinguishes. The correlation between shell width and thread spec is quite loose. There are more than a few reasons why an Italian thread shell may be other than 70mm wide, and more than a few instances of English thread shells being other than 68mm wide. My position is that shell width should be ignored when determining thread spec. Completely agree with this, many scenario's where it ended up not following the norm, standard or pattern, necessity being the mother of invention, all things are possible. 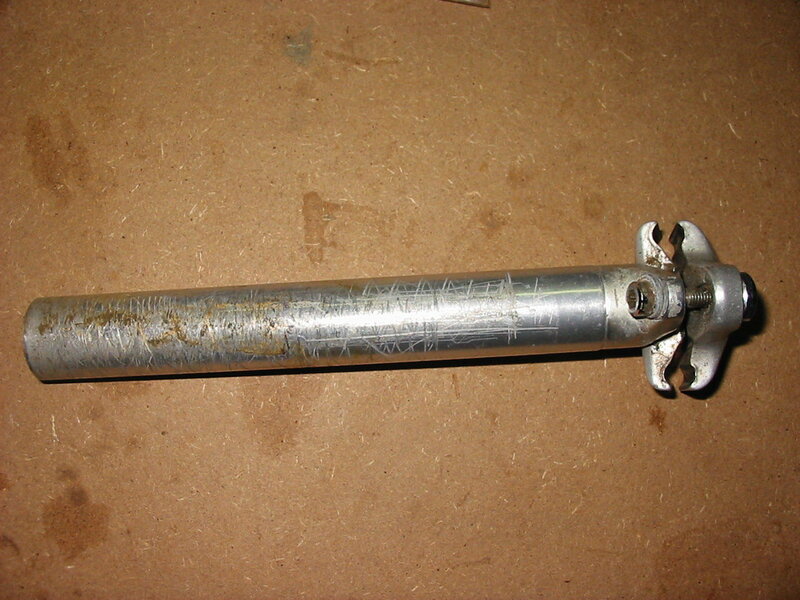 I am searching for a 26.6 Superbe seatpost for my Cimarron. I have the original, but it has two problems - it is deeply scored, and one bolt and nut have been replaced (not even close to the original). I have searched paybay and found some that were too large, and all were about the price (or way more) than I paid for the bike. 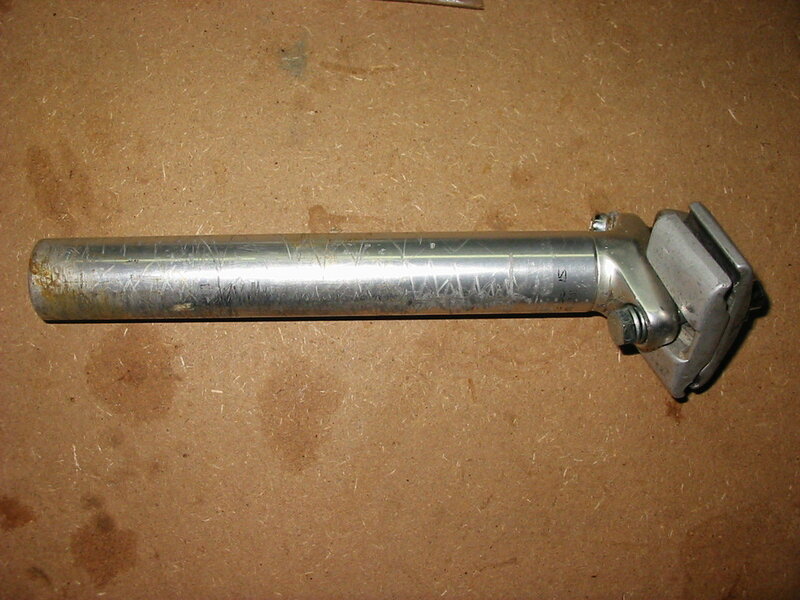 I could sand it down and maybe end with a 26.5mm post, but I would still have the fugly hardware on one side. @malcala622 I'm sure you can do it. A bit of Testor's black paint, a fine brush and a rag dampened with mineral spirits to clean up the margins should do the trick. Neat crank fixing bolt. What is that? Id much prefer to pay someone experienced to do it. The bolts came in a bag of odd and ends bike parts. They were replaced because the caps didnt sit flush with the cranks. You've got nothing to lose, easily undone.If it doesn't turn out good, wipe off before completely dry with thinner, solvent, brake or carb clean and try again. Like a wet/dry erase board. If you're gonna pay somebody, paint them blue. 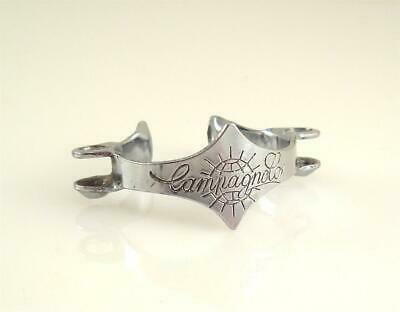 Campagnolo Bar Con cable stop for downtube - the rare one NOS! Thanks for looking out. However, I see presentable used examples on eBay for half that price. I’m just putting the feelers out there for one closer to twenty bucks, or perhaps one that can be traded for. Like this? Email if interested. ISO: Nashbar carbon fork with 1" aluminum steerer. Would prefer the threaded version with at least 9" of steerer, but will accept the 1" non-threaded if it has at least 12" of steerer tube. I have the threaded version in the stash that is available. I will double check the steerer length, but I'm pretty sure it's the longest they made. 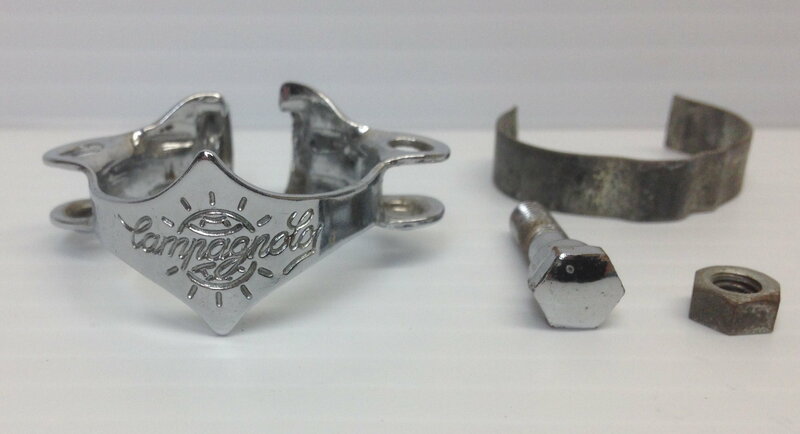 ISO a set of silver MTB brake levers, going on VO porteur bars. The classier the better. Also still looking for a V1 octalink BB. Last edited by degan; 03-27-19 at 07:28 PM.